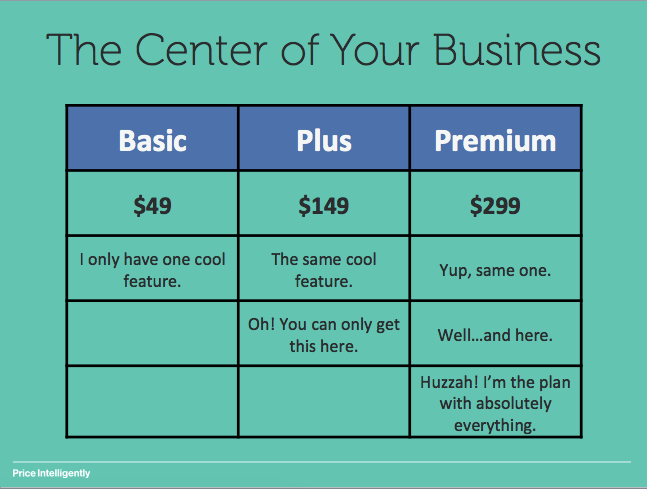 Pricing is one of the most central parts of your business. Everything from your marketing and sales to your product and operations is used to either drive people to your pricing page (or rate card via a salesperson) or support the retention of that customer once they’ve cross the purchase threshold. Pricing’s central nature though means that there are plenty of "cooks in the kitchen” when it comes to opinions on the direction your pricing strategy should take. Unfortunately, many of these opinions we’ve found through surveying hundreds of SaaS companies aren’t supported by any data. Instead, they rely heavily on “gut feel” and guess work. Why is this bad? Well, a 1% improvement in pricing equates to an 11% boost in profit. That’s 3x more of an impact than similar gains in volume or cost efficiencies, meaning that “gut feel” can have disastrous impacts on your bottom line. To help get your pricing strategy in gear, let’s walk through why your pricing strategy needs to be a team sport, before illuminating how you should be setting up a pricing committee for a multi-disciplinary approach to making those 11% gains. "Basing your pricing on 'gut feel' is like building your house on a foundation of jello. It won't end well." Pricing’s central role means the leader of your pricing strategy needs selfless eyes that are exceptionally customer focused. Whomever leads your pricing committee (more on this below) needs to constantly be thinking about the longer term and holistic success of the company, which may come at the expense of the short term success of any particular part of the organization. For instance, you may need to defend a higher price and shore up discounts to ensure better Lifetime Value (LTV) long term. This is great for the long term vision of the company in getting the “right” customers, but may come at the expense of the sales team’s Q3 quota which is lagging behind. While not globally true, most sales teams are closely compensated based on a short term quota, meaning incentives aren’t selfless enough to properly align pricing strategy for the company as a whole. "With pricing strategy you need to be thinking about the long term success of your company"
This isn’t to say non-incentivized parts of the company are a perfect fit either. Finance, Operations, and ironically even Pricing teams in larger organizations aren’t always equipped to measure and implement value based pricing strategies. This is mainly because these organizations are typically exceptionally good at inward facing process optimizations (discount analyses, MRR Churn breakdown and optimization, Customer Acquisition Cost (CAC) analysis, etc.). Yet, they lag a bit when it comes to outward facing market research and customer development. As we’ve spoken about dozens of times, value based pricing requires you to collect data directly from your target customers to determine where they ascribe value. While members of sales operations teams and members of finance are certainly capable of this research, we typically see too much inward or self-serving calculations. Long story, short - read the below, and tread lightly if you’re still going to hand over the reigns to sales or finance. Who should be in charge of pricing then? Your new cross-functional pricing committee. Don’t get us wrong - sales and finance are crucial to the pricing process. Yet, the leader of the pricing committee should typically sit in the marketing or product teams. Most Director, VP, or C-Level folks in these organizations have enough clout to run these projects effectively, are trained in the ways of customer development, and are far enough from a direct incentive to properly think of the organization as a whole. 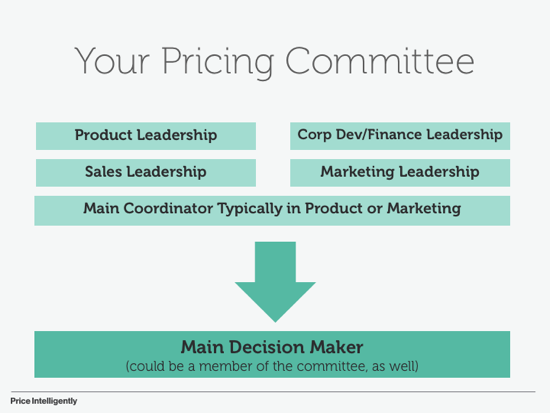 Regardless of the leader of the pricing process, you need a pricing committee. A pricing committee is the strong grip of a hand that pulls your pricing lever, ensuring your organization is thinking of all the details that impact the central fulcrum that is pricing. While the purpose of this committee can vary from organization to organization, the main goal is to ensure equal say and representation from the whole organization and manage the pricing process. One piece of the above puzzle we haven’t harped on enough quite yet is that it’s crucial to make sure that everything funnels into one final decision maker. We’ve seen plenty of pricing committee’s fail miserably either through too much opinion or analysis paralysis, because they didn’t have a decision maker setting deadlines and making the call on what to do next. In a larger organization this is typically a C-level executive that’s either the CEO or the head of product or marketing. In smaller organizations, it’s typically the CEO or founder. 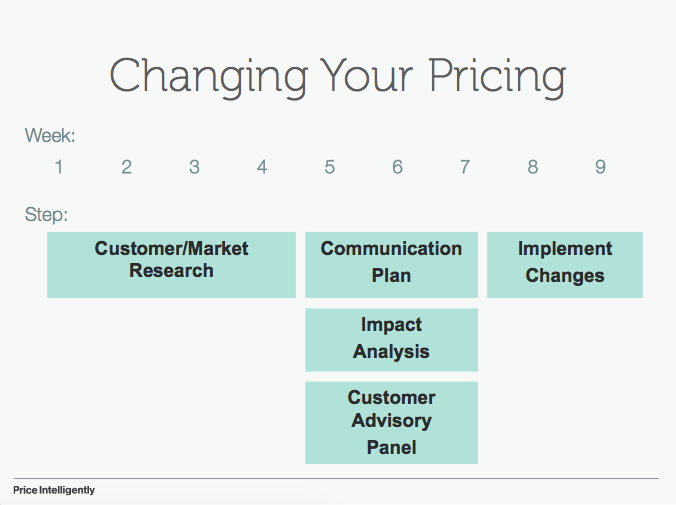 The other half of the pricing committee’s work involves managing the pricing process. We’ve written extensively on the value based pricing process before, but keep in mind that you should be constantly re-evaluating your pricing and your customer personas who are driven to that pricing strategy. Typically, this is a seven to nine week sprint that involves collecting data, making decisions on changes, running an impact analysis, and implementation (all seen in the image below). Now, seven to nine weeks seems like an insane amount of time, but keep in mind that this committee isn’t doing any of this full time. Additionally, the data collection and implementation cycles don’t need to be constantly intense, as smaller organizations will have mixed priorities. Larger organizations should absolutely have someone full time (or at least half time) running the pricing strategy for the company. Further, keep in mind that data collection runs in the background and you’re typically not making major overhauls of your pricing strategy. Instead, you’re focusing in on small tweaks and incremental gains to take advantage of those 11% bumps in profit. If you have any questions at all, don't be afraid to reach out to us. We're here to help!